A colored object may look different against different-colored backgrounds. In this investigation, you'll discover how colors seem to change when you place them against different-colored backgrounds. You need to consider this phenomenon when you pick out colors for carpeting or walls or when you're painting a picture. 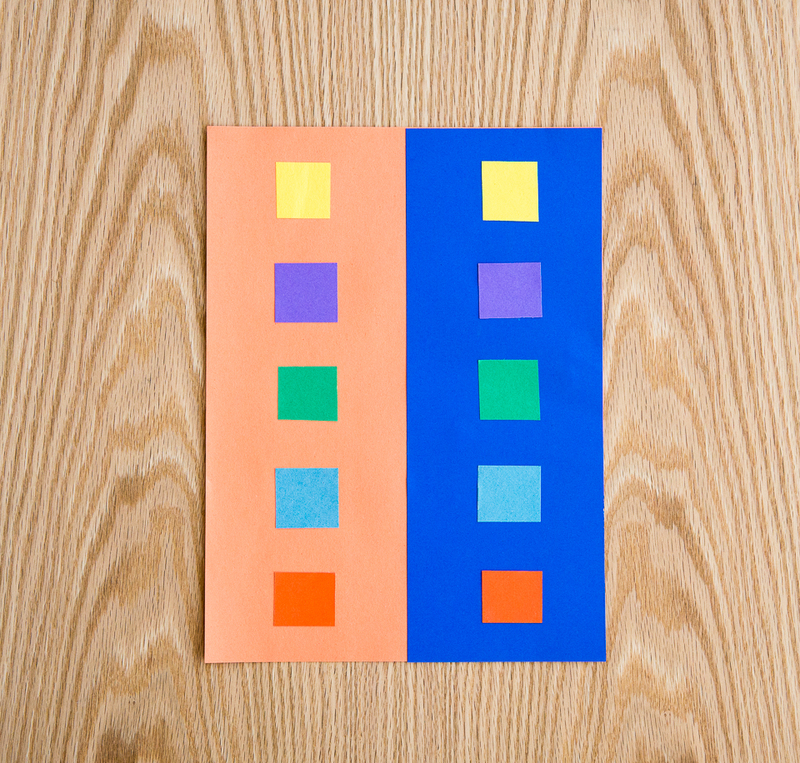 Cut one sheet of orange paper in half lengthwise and glue it to cover up half of a blue sheet. This will give you a large sheet of paper that’s half blue and half orange. This large piece of paper will be your background for other colors. Cut two small squares from each of the colors you have, including squares of blue or orange of a different shade from that of the large sheets. Make two matching, evenly spaced columns of colored squares, one on the blue background and one on the orange background (see image above). 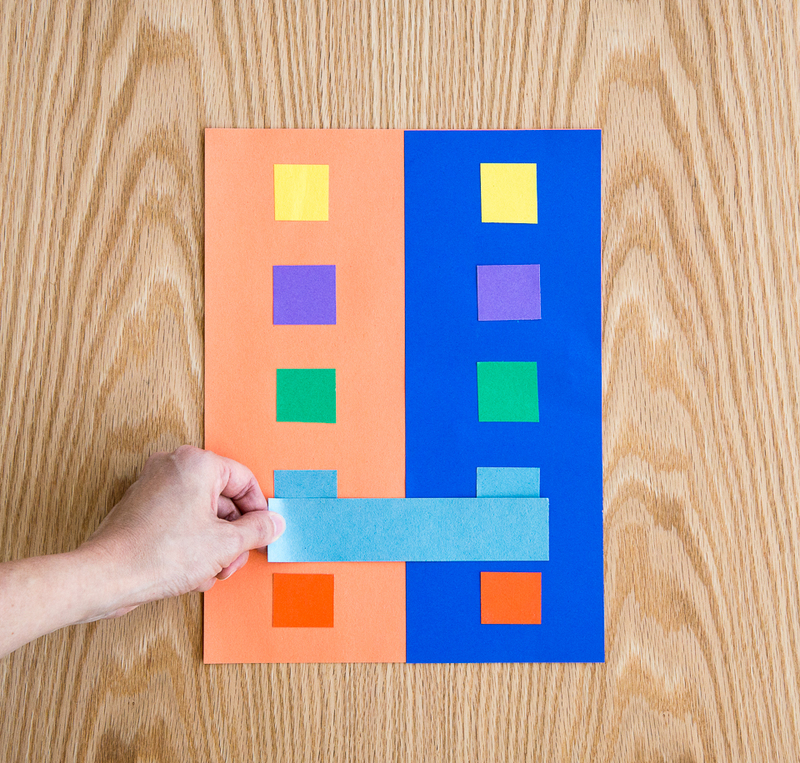 Glue each of the corresponding squares in place on the blue and orange backgrounds. From the same colors as the small squares, cut a strip of each color wide enough that it can be placed over both columns at once for comparison. The illustration below shows two identical sample squares on two different backgrounds, and a comparison bar (click to enlarge). Notice that two small squares of the same color may appear to be different shades when mounted on different-colored backgrounds. Place the comparison strip so that it touches both small squares of color at the same time to verify that the squares are actually the same color. Experiment with different colors to see which background colors make foreground colors appear lighter and which make them appear darker. Color contrast also works in reverse: Against certain backgrounds, different colors can look the same. From the paint samples, choose two shades that are very similar but are clearly distinguishable when placed right next to each other. Put the paint samples on different backgrounds. The slightly different colors may then appear to be the same. You will have to experiment with different backgrounds to get the desired effect. The back of your eye is lined with light-sensitive cells, including color-sensitive cone cells. Your cones affect each other in complex ways. These connections give you good color vision, but they can also fool your eye. When cones in one part of your eye see blue light, they make nearby cones less sensitive to blue. Because of this, you see a colored spot on a blue background as less blue than it really is. If you put a purple spot on a blue background, for instance, the spot looks a little less blue than it otherwise would. Similarly, a red spot on an orange background looks less orange than it otherwise would. When nineteenth-century astronomers observed Mars through telescopes, they saw a wave of green spread down from the planet’s north pole as the polar cap disappeared each spring. Modern astronomers know that this wave of green is actually gray volcanic dust spread by carbon dioxide expanding from the dry ice of the polar cap. A red background makes gray spots look greenish. The gray dust of Mars appeared green to human eyes when it was viewed against the planet’s red background.